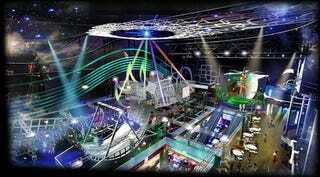 The SEGA Republic - a nine-ride, 150-game amusement park - has officially been opened in Dubai Mall, roughly 18 months after it was first announced. The rides - with names like Spin Gear, Sonic Hopper, Halfpipe Canyon, Storm-G and Initial D4 Limited - are all just standard fun park fare, only with Sega characters stuck over them. They're split over five "zones", labelled Speed, Adventure, Sports, Cyberpop and Redemption. There are also 150 arcade machines scattered around the place, along with plenty of places to spend your hard-earned dirham on Sega merch. Welcome to the 1990's, Dubai. Expect this place to die as spectacular a death as any other Sega "fun park" built outside Japan during the Clinton/Seinfeld era.